If it ain’t broke don’t fix it? As a scientist, I feel a duty to exploit new knowledge to drive innovation, and in doing so, to make things better. So when someone tells me that, “the POWERbreathe works perfectly well”, and cautions me, “if it ain’t broke don’t fix it”, my natural response is to say, “it’s good, but it could be even better”. When I first conceived the idea for the POWERbreathe® in the late 1980s, we knew comparatively little about how to train the breathing muscles. However, what was abundantly clear was that the devices that preceded POWERbreathe® didn’t work very well. Early products were very crude; they generated training loads using simple, static flow resistors, which were akin to breathing through a straw. In other words, they made breathing harder by passing inhaled air through small holes with fixed diameters. This type of breathing training is known as inspiratory flow resistive loading (IFRL) and typical training products allow users to select from a range of different sized holes that occlude the inspiratory port of the device. In theory, for a given rate of inhalation, the smaller the orifice, the greater the load to breathing. In practice, the training load doesn’t just vary with the size of the hole, it also varies with the rate of airflow; the faster one breathes through a given hole, the harder it is to inhale, and vice versa for slow inhalation. This makes IFRL is a bit like pulling a trolley loaded with passengers who keep jumping on and off the trolley; the load is never constant, or predictable. For this reason, IFRL fell out of fashion, and whilst some IFRL products still persist in the market, the primary reason for their continued existence is their low manufacturing cost, because their efficacy is highly questionable. So, at the time that I undertook my first breathing training studies, there was nothing in the market that met my need for a device that delivered an effective training stimulus to the inspiratory muscles. Without any commercialisation agenda (see Blog 1), I therefore set about creating a training device that would provide that most important requirement for any device that is to be used to train muscles - a reliable load. The resulting device was a little “Heath Robinson”, but it imposed a reliable inspiratory resistance using a spring-loaded valve, and became the precursor to the mechanical POWERbreathe® range. As knowledge and understanding of the inspiratory muscles increased, it became apparent (to me at least) that the inherent characteristics of the load provided by the mechanical POWERbreathe® were not optimised. Why so you might ask, surely all you need is a reliable load, a suitable training regimen, and the muscles will do the rest? That’s true up to a point, but effective is not the same as optimal, and I wanted optimal. In order to understand my discontentment with the loading provided by the mechanical POWERbreathe®, it is necessary to delve into some fundamental muscle physiology. Muscles have a number of inherent properties, which if they are overlooked, can impose limitations upon their ability to adapt to training. One of the most important is the fact that the force generating capacity (strength) of muscles varies, depending upon their length. For example, the biceps is weakest when the elbow is fully extended, becomes stronger as the elbow flexes, and then becomes weaker again at full flexion. This property is known as the ‘length-tension’ relationship, and it was first described in detail by an English physiologist called A.V. Hill in the 1930s. Most modern gym weight training machines incorporate a cam system that accommodates the ‘length-tension’ properties of the muscle group being trained. This innovation makes it possible to overload muscles maximally, and also maximises the number of repetitions that can be achieved. In the context of the breathing muscles, their ‘length-tension’ relationship determines the tension (force) they can generate at any given lung volume. Since we cannot measure the force generated by the respiratory muscles directly, the relationship is expressed as a ‘volume-pressure’ relationship. As might be predicted, the inspiratory muscles are strongest when the lungs are empty, and the expiratory muscles are strongest when they are full. 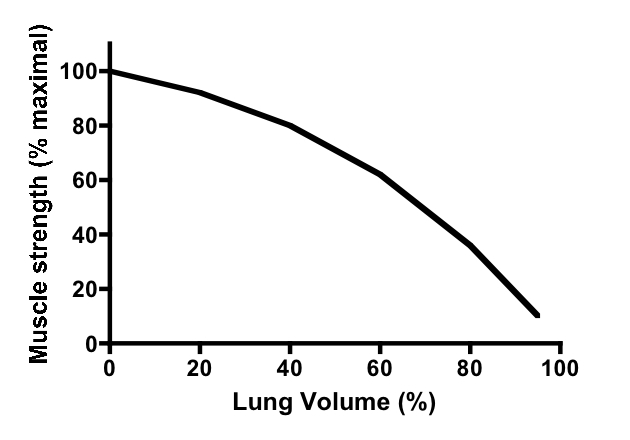 But this relationship is so potent that the inspiratory and expiratory muscles have little or no pressure generating capacity at their weakest lung volumes (see Figure 1 below for the inspiratory muscles). This phenomenon is also known as “functional weakening”. Figure 1. Strength (pressure) vs. lung volume for the inspiratory muscles. Note there is functional weakening as lung volume increases. The practical implications of functional weakening are not obvious at first sight, but they have a profound influence on how the inspiratory muscles respond to a load of fixed intensity (like that provided by a mechanical POWERbreathe®). The problem with fixed intensity inspiratory load is that its relative intensity increases with lung volume. In other words, as the muscles become weaker throughout inhalation, the relative intensity of the load increases. For example, when the lungs are empty, and the inspiratory muscles are strong, the load might be only 50% of the maximal strength. As inhalation progresses, the muscles become functionally weaker, and this same absolute load becomes a progressively greater and greater proportion of the strength of the muscles. Finally, the load exceeds the maximal strength of the muscles at that lung volume, and inhalation must cease. This leads to a phenomenon that I call “breath clipping’. 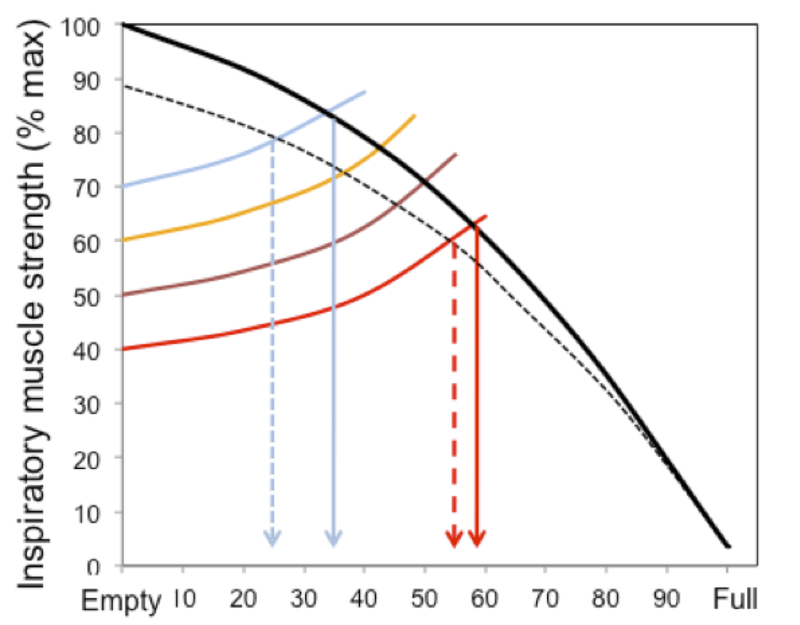 In the Figure 2, the implications of the changing relative intensity of a fixed load are clearer. It illustrates the interactions between inspiratory muscle strength (black line), different training loads (40%, 50%, 60% and 70% of maximal inspiratory muscle strength [coloured lines]) and the breath volume that can be achieved during training, as well as the effect of fatigue (dotted lines). For example, at a load of 40%, it is possible to inhale to around 60% of lung volume, whereas at a load of 70% it is only possible to inhale to around 35% of lung volume before the breath is clipped. This is equivalent to being restricted to the first 35 degrees of elbow flexion of a bicep curl – not very satisfactory. Figure 2. The interactions between inspiratory muscle strength (black line), different training loads (coloured lines). 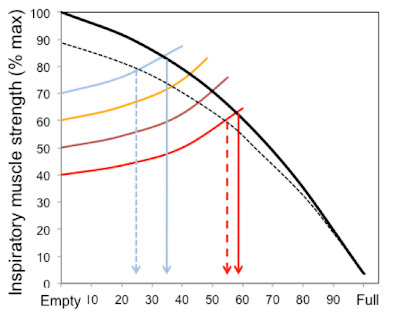 The slopes on the coloured lines illustrate how the relative intensity of the load increases during inhalation. So, what are the practical implications of functional weakening and the breath clipping that results? Although muscle is a very adaptable tissue, research has shown that the adaptations elicited by inspiratory muscle training are specific to a number of characteristics of the training stimulus (Romer & McConnell, 2003 - http://www.ncbi.nlm.nih.gov/pubmed/12569211), including the lung volume at which training takes place. The practical implication of this is that optimal results are only achieved if inspiratory muscle training is undertaken across the full range of lung volume, i.e., from the point at which the lungs are as empty as they can be, to the point at which they are full. Failure to do this will lead to sub-optimal adaptation at some lung volumes, which may have a performance impact if these volumes are called upon during exercise. As can be seen in Figure 2, if the load is too heavy, it’s not possible to train across the full range of lung volume, and the heavier the load, the lower this range is. Furthermore, when you add fatigue into the mix, it becomes even worse. In addition, loading too heavily can also compromise the amount of work that can be undertaken during training, which also impairs the training response. In a recently published study (McConnell & Griffiths, 2010 - http://www.ncbi.nlm.nih.gov/pubmed/20142783), we examined the effects of various inspiratory loads upon a range of different variables, including the number of repetitions that could be tolerated, the volume of each breath during the training session, the amount of work completed during the session, and whether the session activated the inspiratory muscle metaboreflex (see Blog 2 for information about this important reflex). We studied well-trained young rowers who had not undergone any IMT previously. As expected, the number of breaths (reps) declined as load increased (e.g., just 4 breaths at 90% of maximal inspiratory muscle strength and 84 breaths at 60%), and the volume of each breath declined with increasing load, as well as during each session (because of fatigue). The most surprising finding was the influence of heavy loads (>70%) upon the amount of work that was undertaken per breath (work is equivalent to the load multiplied by the breath volume). Because the volume of each breath was lower with heavy loads, the amount of work done per breath was reduced markedly. This effect is completely counter-intuitive, because during limb muscle training, heavier loads mean more work (that’s because if you’re maintaining good form, the range of movement doesn’t change a great deal when moving from moderate to heavy loads). The detrimental effect of the reduction in breath volume upon the training stimulus delivered to the inspiratory muscles was compounded by the reduction in the number of breaths at heavy loads. In other words, the total amount of work done by the inspiratory muscles is reduced markedly by increasing the load above 70%. This finding explained some confusing results from previous, unpublished studies undertaken by two of my Masters students. In two separate studies, we noted that professional rugby players, and professional soccer players showed virtually no change in inspiratory muscle function in response to training at loads in excess of 70%. So you can have too much of a good thing! It should be apparent by now that, although the mechanical POWERbreathe® ain’t broke (it works extremely well), it could benefit from some improvement. The optimal training device would be one that enabled heavy loading, without compromising lung volume achieved, and work done. That was the conclusion I reached in 1997, and it sparked an ambition in me to develop the “perfect POWERbreathe®”. Somewhat frustratingly, it has taken more than a decade to realise my original vision, but it’s finally here. As luck would have it, all of these requirements can be satisfied by a loading mechanism that is sympathetic to functional weakening of the breathing muscles (Figure 1). In other words, rather than maintaining the same absolute load throughout the breath, it maintains the same relative load, i.e., despite functional weakening, the load starts at 50% of the strength, and ends at 50%. To achieve this the device needs to taper the absolute load during inhalation, so that it is the same shape as Figure 1 (above). The POWERbreathe® K-Series (PBK) does precisely what the physiology specified for the perfect POWERbreathe® - it provides a tapered load that optimises breath volume, work and tolerability during training. The PBK design is a departure from the spring-loaded valve technology of the past, favouring instead, real-time, dynamic adjustment of a flow resistor valve. In essence, the surface area of a variable flow orifice is adjusted within each breath according to the prevailing respiratory flow rate. It’s the world’s first dynamically adjusted flow resistance trainer, and it is the result of a long-term collaboration between POWERbreathe®, myself and colleagues at Brunel University in London. Adjustments to the valve are made 500 per second, taking less than a millisecond to complete (see video clip 1 below). This means that, in theory, ANY pressure load profile can be imposed. In practice, a tapered load akin to that in Figure 1 is provided (see video clip 2 below). This allows for maximal volume excursion, and a considerable improvement in tolerability, which enhances the number of breaths before ‘failure’. Trials have also revealed that at loads above 50% of inspiratory muscle strength, the amount of work completed per breath is greater using the PBK than when using the mechanical POWERbreathe®. The tapered load also permits ‘heavier’ loading, improving the amount of work done per breath still further. Video Clip 2: BreatheLink® software providing continuous feedback during PBK training. Top left panel is the training load during each breath. Of the many unique and innovative features offered by the PBK, its auto load setting utility is one that many users will find especially helpful. Every training session starts with two unloaded set-up breaths, during which the user must exert maximal effort to inhale as quickly and deeply as possible. These set-up breaths provide data that are used to calculate an index of inspiratory muscle function, and a measurement of lung volume. In “Automatic” mode, the former is used to automatically programme the appropriate training load; the latter is used to provide a personalised taper for the training session. This means that the loading of each and every training session is optimised to the prevailing function of the inspiratory muscles. Of course, it’s also possible to set your load manually, and with the BreatheLink® software it’s even possible to create your own training sessions, and to upload these to the PBK unit. I’ve been experimenting with some interval training sessions using this facility. Needless to say, the ability to make within and between breath adjustments makes this type of device extremely versatile from the loading perspective. 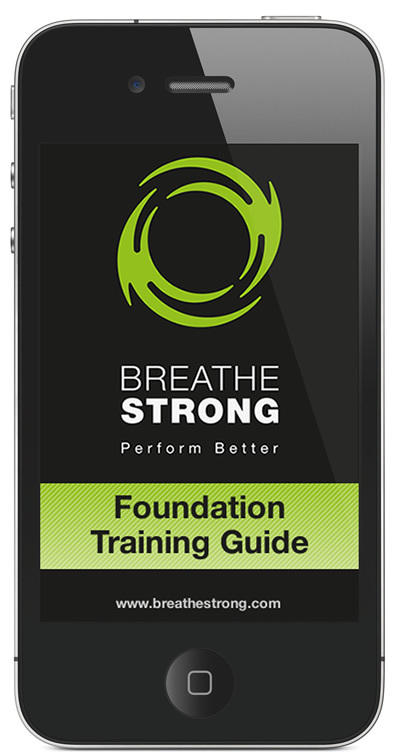 Look out for the FREE Breathe Strong Foundation Training App on iTunes at the end of the month. If you found my Blog interesting, please come back for further articles and news, as well as my musings on all things breathing and sport related. 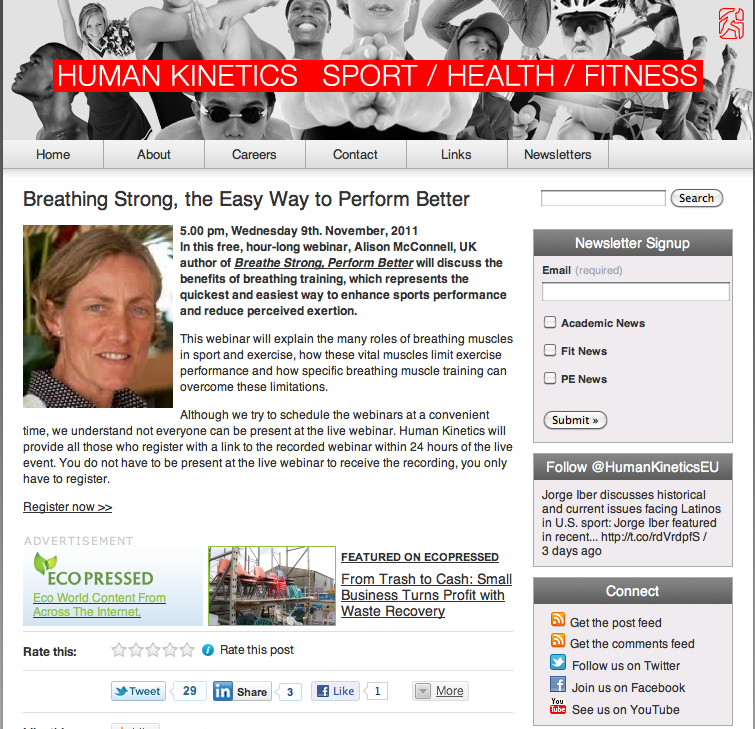 Also, don’t forget that you can obtain more information about breathing training at www.breathestrong.com, where you can also find out about my comprehensive guide to breathing and exercise “Breathe Strong, Perform Better” (published by Human Kinetics Inc.). Scroll to the bottom of this page to visit the ‘Breathe Strong’ Amazon store. 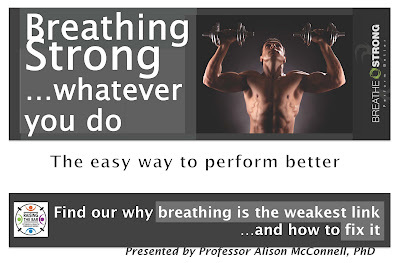 You can obtain more information about breathing training at www.breathestrong.com, where you can also find out about my comprehensive guide to breathing and exercise “Breathe Strong, Perform Better” (published by Human Kinetics Inc.). Visit the ‘Breathe Strong’ Amazon store by clicking here. 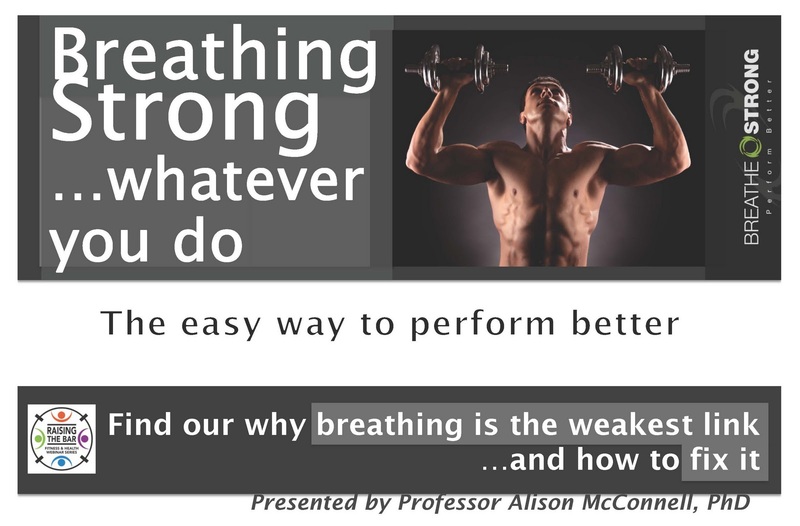 In preparing for my webinar, it occurred to me that I should perhaps post a Blog entry about my book, Breathe Strong, Perform Better, only a snapshot of which I will provide in my webinar. 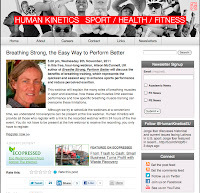 Please feel free to leave any comments or feedback about Breathe Strong, Perform Better at this Blog site. Almost 20 years ago, I began to question the universally held belief (among sport scientists) that breathing did not limit exercise performance. The magnitude of this heresy cannot be overstated, and the shift in thinking that has occurred over those 20 years has been nothing short of seismic. Now, specific training of the breathing muscles is an integral part of conditioning in elite sport, and it has filtered to the grassroots level in a huge range of sport and fitness settings. So obvious is the logic of breathing muscle training—and so impressive are its outcomes—that it has become one of those “no-brainers” that so often arise with the benefit of 20/20 hindsight. Just as we now wonder how our grandparents didn’t understand the importance of fluid balance during exercise, people now wonder why it’s taken until the first decade of the 21st century for breathing muscles to be considered an integral part of the conditioning process. Although huge strides have now been made, we still have a way to go, because even the most progressive and enlightened of scientists and coaches still don’t fully appreciate how fundamentally the breathing muscles contribute to performance and movement in sports. In other words, the need for breathing to be considered as an integral part of functional training is not widely understood. Nor should it be, because the science that underpins this is relatively new and highly specialised. Breathe Strong, Perform Better seeks to plug the knowledge gap alluded to above. It gives non-specialists access to information that is normally the preserve of scientists, professional coaches, and elite athletes. The book is for anyone who wants to optimise the many benefits that arise from improving the physical performance of the breathing muscles. Don't be fooled by the cover, it's not just for cyclists; in fact it covers activities as diverse as running and weight training. Whether you are an Olympic contender, a coach of high-level athletes, or a fitness enthusiast who just wants to make your workouts more comfortable, this book contains something for you, or someone you know (Christmas is coming!). I'm very proud to say that the Foreward to my book is by one of Britain's greatest Olympians, Sir Matthew Pinsent. In his Foreward he says of breathing training, “Advances in sport science knowledge are few and far between, but numbered amongst these rarities is the discovery that breathing has such a profound influence upon performance that it merits specific training”. Breathe Strong, Perform Better is a distillation of almost 20 years of research and practical experience of breathing training. It is based on world-leading scientific research, and describes cutting-edge applications of breathing training for a wide range of sports and fitness activities, including techniques that have been applied to athletes who were (or have become) world or Olympic champions. The book provides readers with the knowledge they need to get the best possible results from breathing training and get better results from their other training by optimising the breathing muscle contribution to that training. Why should you be interested…? 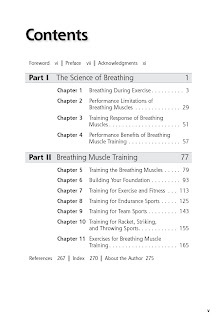 If you’ve never heard of breathing muscle training (unlikely as that seems), your first question might be “Why would I want to train my breathing muscles?” The long answer is contained within the pages of Breathe Strong, Perform Better, but the short answer is that whoever you are, training your breathing muscles can make any physical challenge feel easier. So whether you’re participating in a 40K time trial, an interval training session, or a step class, training your breathing muscles will help you breathe easier. Breathe Strong, Perform Better is also a response to an important development that has taken place in rehabilitation and conditioning over recent years—the rise of functional training. The application of functional training techniques to a wide range of settings has become mainstream, but it lacks a vital component. The missing link in functional training is the integration of breathing and the contribution of breathing muscles to functional movements. Breathe Strong, Perform Better provides this link, and it explains how to achieve the best results for specific sports and fitness settings. Functional breathing training will therefore reduce the risk of injury, because it enables the breathing muscles to accommodate their role in helping to stabilise the body’s core more effectively. Breathe Strong, Perform Better is intended to answer all your questions about breathing training, whether those questions are scientific or highly applied. Your questions might include the following: What are the benefits to performance? What’s the best equipment to use? How long will it take? What’s the best training regimen? How do I ensure that I get results? How do I know I’ve improved? How does it work? How do I train functionally for my sport? In addition to answering these questions, the book contains case studies that illustrate how different people came to try breathing muscle training, how they approached it, and the results they achieved. I’m often asked why I became interested in the fairly obscure subject of breathing. As is often the case with scientists, my interest originated from my own experience and my desire to understand what was happening and why. As a student in the early 1980s, my life was dominated by two things: my interest in human physiology and my love of competitive sport. These two interests were not unconnected. As a mediocre rower, I was always let down by the apparent inability of my breathing to keep pace with the demands of racing (or training for that matter). One of my crewmates once commented that I sounded as though someone had taken me by the throat at 500 meters and hadn’t let go. I felt severely limited by my breathing, but everything I’d been taught about the limitations to exercise performance told me that breathing was not a limiting factor to my performance (see Blogs 2 to find out how wrong this was). For some time, I accepted the common belief that breathing does not limit exercise performance. However, my personal (mostly excruciating) experience eventually propelled me on a quest to understand more about breathing, about the conditions under which it becomes limiting, and especially about how we might overcome these limitations. The rest, as the saying goes, is history. My quest for understanding has been a fascinating journey that has led me beyond exercise physiology and into territory that has broadened my horizons. Like so much of science, the journey began as a bit of a detective story, where snippets of evidence from seemingly unrelated areas were pieced together, eventually providing that final “eureka” moment when everything fell into place. Breathe Strong, Perform Better enables its readers to share in what I’ve learned on my journey; the many tangents from my original path are reflected in the breadth of applications for breathing training that now exist (breathing muscle training is not just for mediocre, breathless rowers!). Some of these applications are medical and are beyond the scope of Breathe Strong, Perform Better (except asthma), but the number of applications in sport has amazed even me. I’ll be addressing the medical applications of breathing training in a new book that I am currently working on with the publisher Elsevier (out in early 2013). Exercise scientists are arguably unique among scientists, because we are usually practitioners in what we study. Unlike, say, an astrophysicist who has no experience of going into space, exercise scientists know exactly what the challenges of sport competition are, because they have almost certainly taken part in competitive sport at some time. In other words, exercise scientists have the ability to view things from both sides of the fence. One of the most gratifying compliments that I ever received was from a coach who told me, “You have an excellent feel for the practical application of research to [elite] sport.” This ability is reflected in my experience of applying the knowledge and insight I have gained as a scientist to the task of providing innovative, evidence-based advice on how to get the best results from breathing training. Breathe Strong, Perform Better enables everyone to benefit from this, as well as from the feedback I’ve gained from the athletes, coaches, and other practitioners whom I’ve worked with over the past 15 years. Breathe Strong, Perform Better is divided into two parts. The first part explains some of the science and theory of breathing, while the second part is a practical guide on how to get the most out of breathing training. Although these sections are inevitably interlinked, it is not necessary to read the science in order to benefit from the practical guidance. The theoretical section (part I) provides information on the theoretical building blocks that support the practice (part II). Accordingly, readers can dip in and out of part I based on their need and interest. For example, coaches are quite rightly suspicious of snake oil sellers who peddle potions and gadgets “guaranteed” to improve performance. Therefore, most coaches will want to review the section describing the underpinning theory and evidence of the ergogenic effect of breathing muscle training before committing themselves (or their athletes) to putting it into practice. The theoretical building blocks include aspects of the relevant anatomy and physiology of the respiratory muscles and other associated muscles. As a part of this discussion, the rationale for specific breathing muscle training is established. This includes a description of the respiratory system as a source of exercise limitation, as well as a description of the most common chronic condition that affects athletes—asthma. The role of breathing muscles in functional movements is also explained, because this provides the rationale for functional breathing training. Consideration is also given to breathing patterns during different exercise modalities. From this scene setter, we move on to consider how breathing muscles limit training and competition. This information is subdivided into specific sporting contexts, providing insights into the range of benefits that can be derived in these contexts. The rationale for functional breathing training is also presented, before moving on to consider how breathing muscles respond to training, which sets the scene for a description of the performance benefits of breathing muscle training in a range of sports. 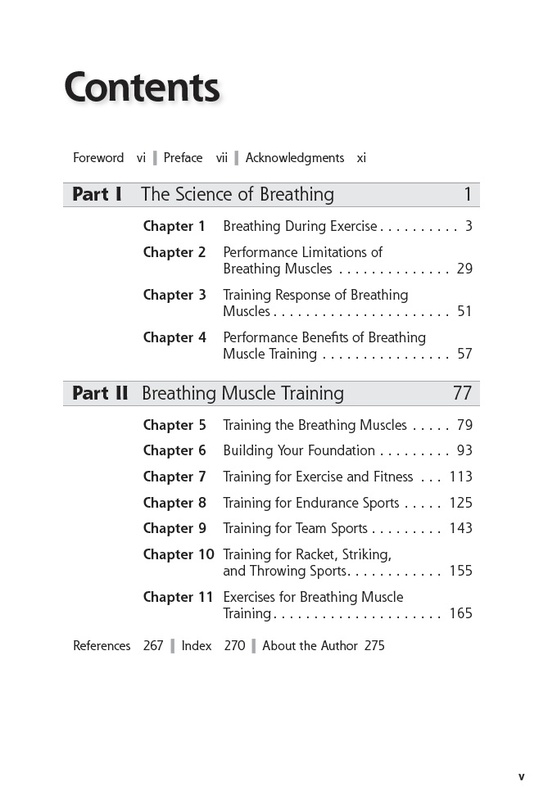 The practical section of the book (part II) begins by guiding readers through generic aspects of the most widely used form of breathing training—that is, inspiratory resistance training. The general principles of training are considered, as well as different methods of training (resistance versus endurance) and proprietary equipment. Foundation training1 is described, as well as guidance on principles such as posture and breathing technique. There is also a step-by-step guide to getting started with Foundation training. Finally, there are four chapters that introduce some functional training techniques, each taking a sport-specific approach. These chapters are supplemented by case studies and narratives from advanced users that contain top tips for optimal results. The insights from these elements will help you see how creatively inspiratory muscle training can be applied. 1. Foundation Training refers to the fist four to six weeks of specific, isolated resistance training of the breathing muscles. By using a device that can be likened to a dumbbell for your breathing muscles (e.g., the POWERbreathe®), the strength, power and endurance of these muscles can be increased. A typical training regimen consists of 30 breaths, inhaling against a moderate intensity load, twice per day. Training sessions last less than two minutes, and can be undertaken virtually anywhere, making this one of the quickest and easiest training adjuncts around. 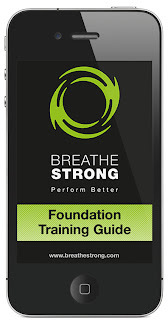 Look out for the FREE Breathe Strong Foundation Training App on iTunes at the end of November '11. On Friday September 30th, I’m presenting a 30-minute seminar at the Cycle Show Expo at the NEC (www.cycleshow.co.uk, Cycle Arena, 12.30pm). The title of my talk is "Breathing Strong in the Saddle: Improve Your Riding the Easy Way". In this Blog, I’m going to give you a sneak preview of what I’ll have to say at the Cycle Show next week. I’m going to approach the seminar by considering two sides of the same coin - the limitations that breathing muscles impose upon cycle performance, and vice versa. Why vice versa? Because the body position in cycling presents a number of problems that aren’t present in other sports, especially for time trialists and triathletes who are using aerobars. We all know that minimizing frontal area minimises aerodynamic drag, but this benefit has a cost (see www.bikeradar.com/racing/article/aero-position-isnt-everything-31165 for a very interesting article on this), and much of that cost is borne, by the breathing muscles. Research suggests that cyclists who are inexperienced in the use of aerobars exhibit detrimental effects on their breathing and mechanical efficiency compared to cycling in the upright position (www.ncbi.nlm.nih.gov/pubmed/14514538). For example, compared with upright cycling, aerobars resulted in a lower maximal oxygen uptake and lower maximal ventilation. In addition, breathing appeared to be constrained, such that breath volume was lower and breathing frequency was higher. This is a very inefficient breathing pattern; indeed, the study found that mechanical efficiency was lower when using aerobars, i.e. the same amount of cycling work required more energy. The explanation for these findings resides in the influence of a crouched body position on inspiratory muscle mechanics during cycling. First, there is an effect on diaphragm movement caused by the large organs of the abdominal compartment (stomach, liver, and gut). These organs lie immediately below the main inspiratory muscle, the diaphragm, and they are effectively a noncompressible mass (visceral mass) that must be pushed out of the way by the descending diaphragm. 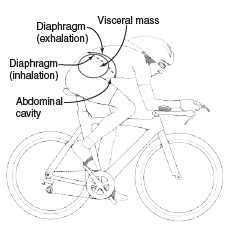 When a cyclist is crouching forward, the abdominal organs press against the diaphragm, impeding its movement; the volume of the abdomen is also reduced, which means there is less space to accommodate movement of the visceral mass during breathing (see figure below - from "Breathe Strong, Perform Better", Human Kinetics). Impediments to diaphragm movement during cycling. The abdominal wall, which normally bulges forward during inhalation, is also stiffer because it contributes to core stabilization, increasing diaphragm work still further. In addition, the extreme hip flexion brings the thighs closer to the abdominal wall, where they can also impede its outward movement during inhalation. These effects conspire to impede the free movement of the diaphragm and rib cage muscles, increasing inspiratory muscle work. Second, if cyclists are forced to adopt a higher breathing frequency (because breathing deeply is too uncomfortable in the crouched position), inspiratory flow rate must be higher. This forces the inspiratory muscles to work in a region of their force–velocity relationship where fatigue and effort perception are greater (find out about the force-velocity relationship and other properties of muscles here - http://muscle.ucsd.edu/musintro/props.shtml). Because studies appear to show that the aerobar position has fewer detrimental effects in cyclists who have used aerobars for a prolonged period, it appears likely that the inspiratory muscles adapt to the increased demands imposed by aerobars. A shortcut to this adaptation is to train the inspiratory muscles so that they are able to cope with the mechanical changes induced by the aerobar posture (visit www.breathestrong.com for information on how train the inspiratory muscles). Now it’s time to consider the other side of the breathing/cycling coin, i.e., the limitation that breathing muscles impose upon cycling performance. There are two components to this; first, we need to consider the performance implications of the fact that breathing muscles are an integral part of the core stabilisation system; second, we need to consider the metabolic repercussions of breathing muscle work during cycling. In most sports, including cycling, the core provides the foundation from which force is generated. The stabilising action of the core is very important for the production of cycling power. This is illustrated by the fact that external stabilisation of the trunk (i.e., relieving the core muscles of the need to stabilise the trunk) significantly reduces the metabolic cost of cycling (www.ncbi.nlm.nih.gov/pubmed/16258182). The effect is greatest at pedaling speeds that induce the highest pedal forces. In other words, cyclists expend a lot of energy stabilizing their trunk in order to optimise power production. If the core provides the foundation from which force is generated during the pedal stroke, and if the stability of the core is influenced by breathing, a question then arises regarding the best time to breathe during the pedal cycle. Because a complete respiratory cycle (breathing in and out) occurs only once every two or three pedal revolutions, it is inevitable that force will not always be exerted on the pedals during, for example, an exhalation. To date, no studies have examined the potential benefits of breathing during particular phases of the pedal stroke, and this is probably because it’s unlikely to have a large impact on performance. However, more than just performance should be considered. Exerting force on the pedals during the pedal downstroke requires the coordination of more than just the leg muscles. The stability of the upper body also needs to be maintained in order to ensure that it provides a stable foundation and that spinal movements are controlled. If a vital part of this stabilizing system is otherwise engaged (in breathing), the potential exists for impaired function of the core. At high pedal rates (greater than 70 rpm), the forces transmitted to the pedals are relatively small compared to the maximum force-generating capacity of the muscles involved; therefore, the competition between the postural role of the trunk muscles and their role in breathing is not as problematic as it is in sports such as rowing. However, during steep hill climbing, pedal rates drop, and pedal forces increase. During climbing, cyclists may find it advantageous to synchronise breathing and pedal cadence; indeed, this tends to occur intuitively, especially on very steep climbs. Notwithstanding this, evidence from elite cyclists suggests that the most important aspect of breathing and pedal synchrony is keeping a steady rhythm for each and maintaining a 1:3 ratio (1 breath for every 3 pedal revolutions). This ratio will optimise the efficiency and comfort of breathing, but a cyclist needs to work at maintaining the ratio; the reason that cyclists slip into a 1:2 ratio is because their inspiratory muscles are not sufficiently strong and fatigue resistant to maintain breath volume. This is where specific breathing muscle training can help (see "Heavy breathing" improves performance, below). 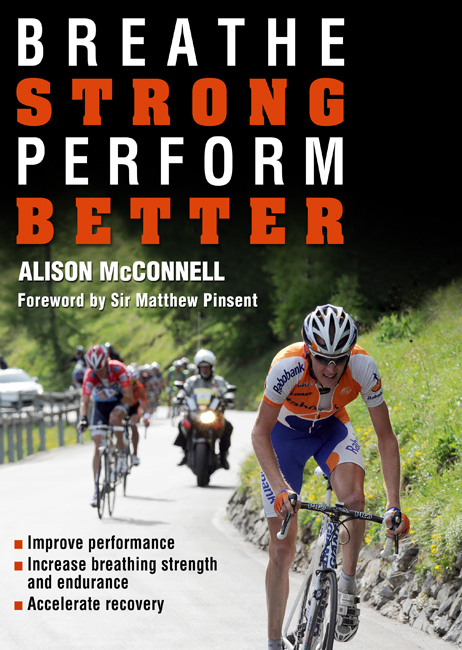 My book, “Breathe Strong, Perform Better” includes specific guidance on how to optimise breathing training for cycling, as well as how to undertake breathing muscle training using functional training principles in order to optimiase the contribution of breathing muscles to cycling mechanics. In considering the metabolic repercussions of breathing muscle work during cycling, we can again turn to the scientific literature. 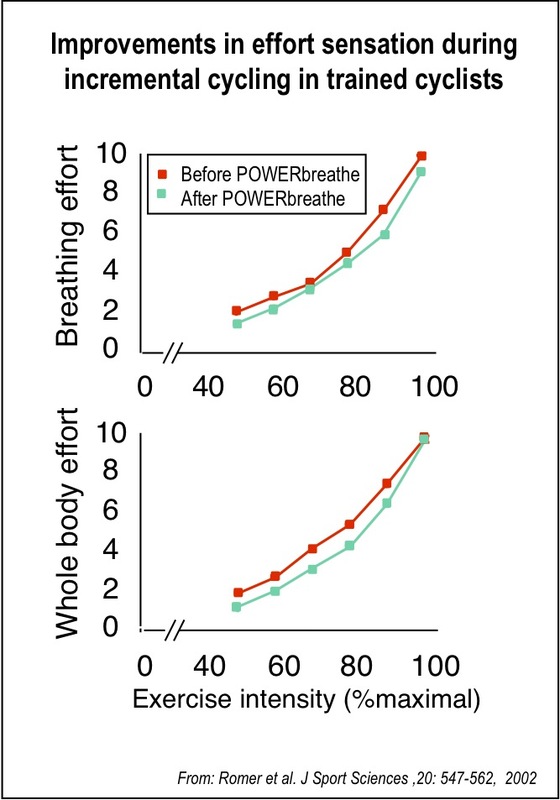 Perhaps the most striking demonstration of these repercussions is considering what happens to cycling performance if we train the breathing muscles (specifically, the inspiratory muscles), using a bit of “heavy breathing” (see www.breathestrong for details). In other words, let’s look at what happens when we minimise any limitations that the breathing muscles impose. We published a research paper on this in 2002 (www.ncbi.nlm.nih.gov/pubmed/12166881), and it remains the most comprehensive and compelling study of inspiratory muscle training (IMT) to date. 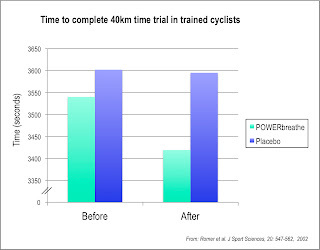 In a nutshell, we found that six weeks of IMT improved 20km laboratory time trial performance by 3.8% (66 sec) and 40km time trial performance by 4.6% (115sec) (see figure above). 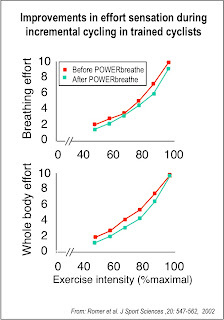 The cyclists also felt that their breathing and whole body perceived exertion were lower (see figure opposite). 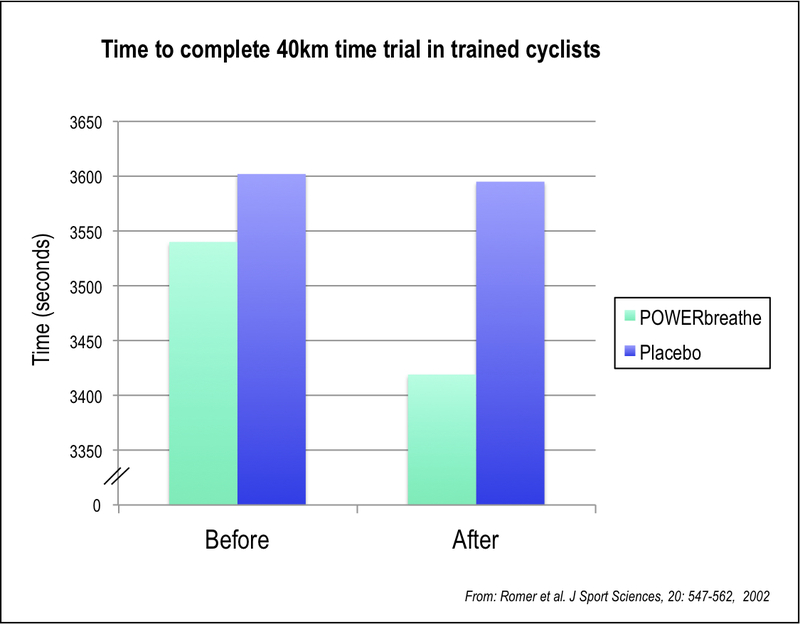 In other words, they felt that the same cycling power output was easier. In addition, the exercise-induced fatigue of their inspiratory muscles was abolished after IMT. These changes were made possible by the improvements in strength, power and endurance of the breathing muscles; for example, the peak power output of the cyclists' inspiratory muscles increased by 39%. Find out why performance improved by reading my previous Blog. So there you have it, a sneak preview of my seminar for the Cycle Show (www.cycleshow.co.uk).